My response is, “Not much different from traveling in Ontario, Manitoba, New York, Utah or any other region in North America.” Of course, that’s just my opinion and its not based on any scientific sampling or survey. 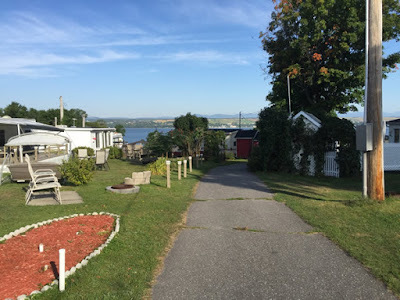 Rather, it comes from months spent roaming the byways and back roads of the Belle Province, staying in dozens of RV parks, visiting countless attractions and taking part in numerous activities. 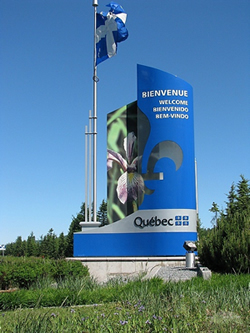 As such, I’ve found Quebec to be a beautiful province filled with history, culture, breath-taking scenery and friendly, hospitable people. While the unilingual position of the province does pose some challenges for non-French speaking RV’ers, from my experience, it’s not that big a deal. Take road signs, for example. Certain road signs are universal in their meaning. 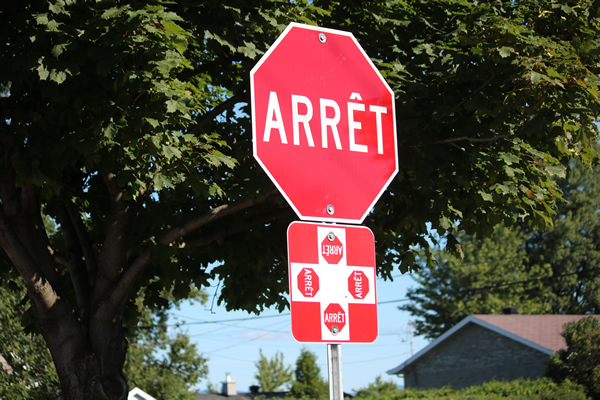 An eight sided, red coloured sign at the end of a street means “Stop” in any language even if the word in the middle isn’t “STOP” but “ARRET”. 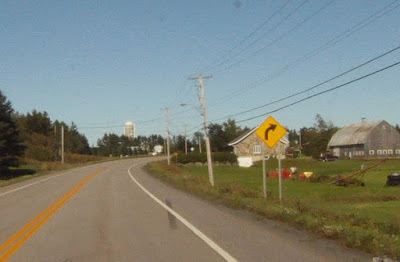 A triangle shaped sign means yield. 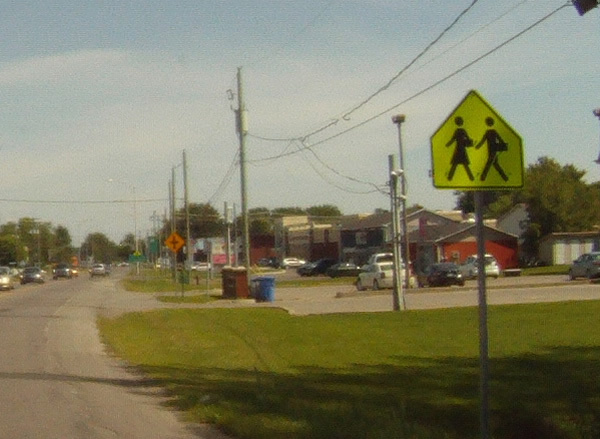 A 5 sided yellow sign with a pointed top indicates a school zone. 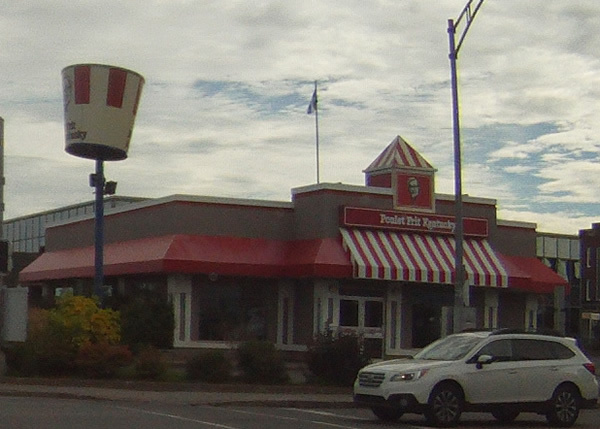 Even signs without unique shapes often display a picture or symbol with a common meaning. The letter “P” surrounded by a red circle with a line through the middle means no parking while a sign with an arrow curving right is warning of a right hand corner ahead. If anything, Quebec’s road signs tend to use more images and symbols than other provinces and for good reason. Many drivers on provincial roads are from out of province with little or no French Language proficiency. 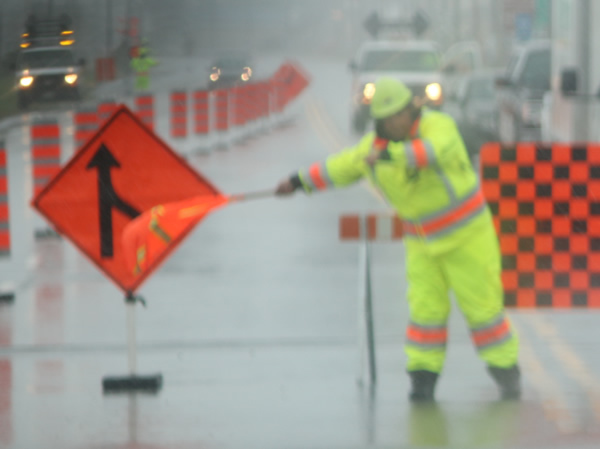 Like it or not, accommodations must be made – for safety reasons, if nothing else. Some of these signs can be quite imaginative. My favourite is the “Reduisez le Brrrruit!” sign, which is a visual, if somewhat unusual way of warning truckers not to use their engine brake. 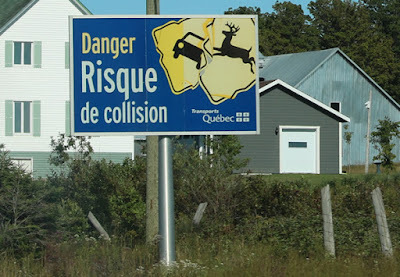 Another shows a deer and a car with the caption, “Danger: Risque de collision”. 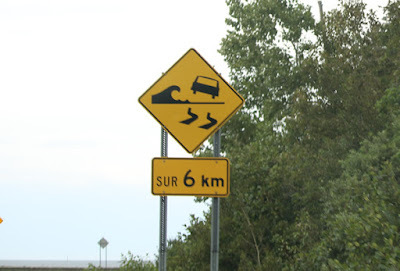 Even though these signs do have some text, the pictures used are definitely worth a thousand words - in any language. 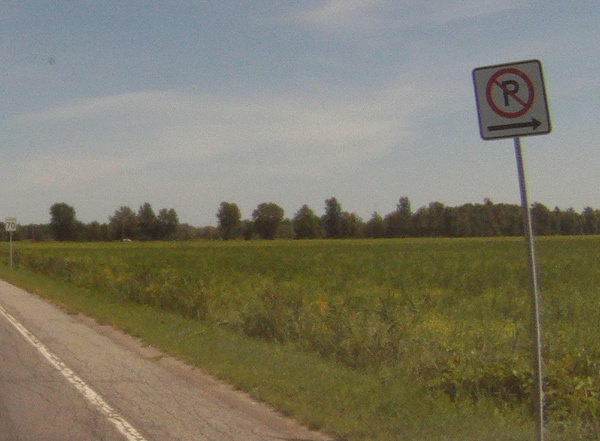 Some road constructions signs can be a bit more challenging as they are more text based than visual. Even then, the meanings can usually be discerned with a little experience and deductive reasoning. 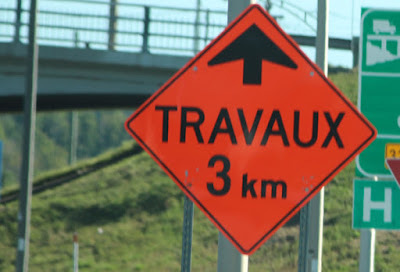 A good example is an orange sign displaying the word “Travaux”. The first time this sign is encountered, it might be a bit puzzling but the meaning soon becomes crystal clear. It’s warning of road construction ahead and anyone travelling the provincial roads during the summer months will definitely encounter more than a few of these. Speaking of road construction, this is another area where Quebec has some unique differences. 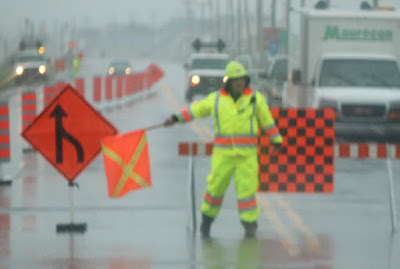 Its the only province I’ve encountered where many of the flag people directing traffic through road construction zones actually use a flag to control that traffic, rather than a sign with the word, “SLOW” on one side and “STOP” on the other. If the flag person is waving a red flag back and forth across their body, that means “Stop”. Waving it from side to side beside their body or using it to point the direction of travel means “Proceed”. It may be different but not difficult to figure out and, it can be highly entertaining. 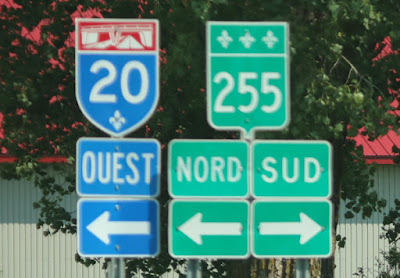 There are however, some French words that are handy to know when travelling and easily learned, such as directions. “Ouest” is the word for, West. East is “Est”. South is “Sud” and North is “Nord”. 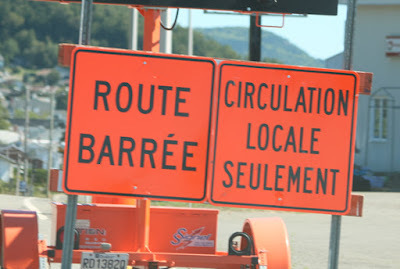 Other useful words include “Rue” for road, “Chemin” for highway, “Pont” for bridge “Fin” for end and “Barré” for closed. 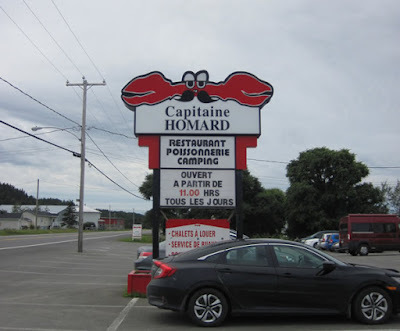 A few signs may require a little more knowledge or at the very least, a smart-phone translation app. 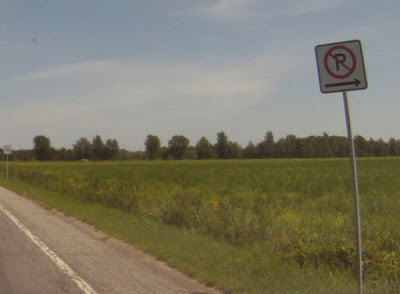 These signs however, tend to be informational such as “Don’t Drink and Drive”, “Leave Your Cellphone Alone” or “School Is Back in Session, Watch for Children”. Good advice to be sure but hardly critical route information. 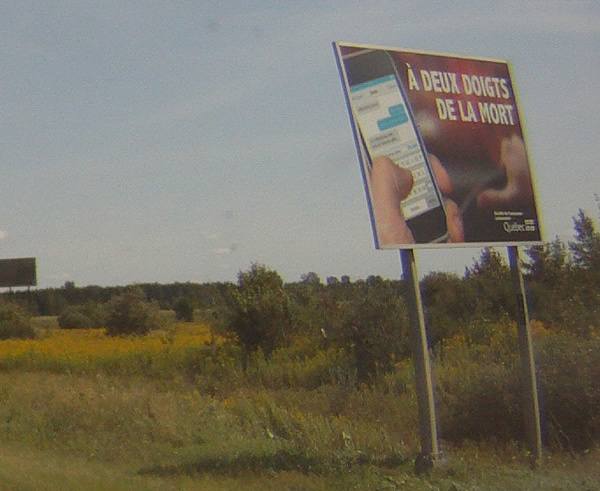 As for other situations such as roadside billboards, posters or commercial signs, some are easy to decipher while others require a bit more work. For example, it doesn’t take a linguist to determine the meaning of a ReMax sign on a front lawn of someone's house with the words, “À vendre”. And, the smiling face of Colonel Sanders on the front of a restaurant is a pretty good indication of what’s available inside even if the words, “Poulet frit de Kentucky” are not familiar. Menus, information pamphlets, tourist brochures and even web sites can be more problematic. Many are bilingual. For those that aren’t, technology in the form of a smart phone translation app or online translation service can be a huge help. That’s the written word but, what about the spoken word or, talking to people? Is that an issue for someone who doesn’t speak French? Here again I’ve encountered very few problems. While I do know some words and phrases acquired many decades ago in high-school, I am by no means fluent. 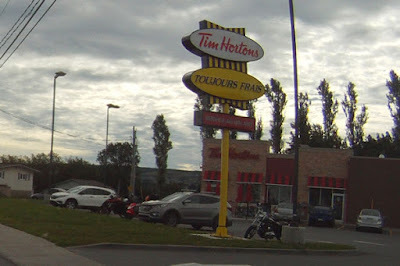 And I suspect, I’m not that different from most other English Canadians who also know a few words and phrases, thanks to things like high school French classes, Hockey Night in Canada and bi-lingual product packaging. As well, it’s amazing what can be picked-up just by being in the province, seeing the signs and listening to people. For example, RV’ers quickly learn that “trois services” (three services) in a campground means a site with sewer, water and power. 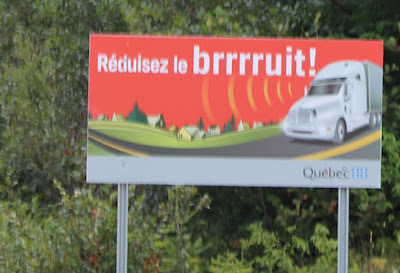 In addition, many English words and phrases such as “back-in”, “pull-through”, “toilets” and “showers” have been adopted by French campground operators. 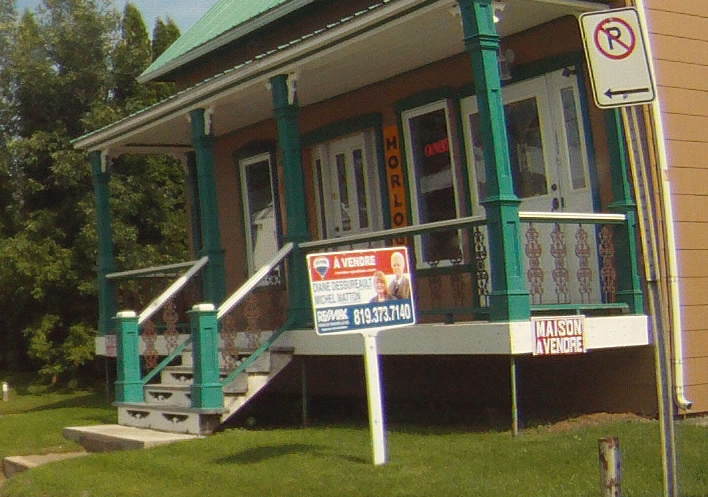 Speaking of RV parks, the biggest challenge for most RV’ers is often not language as much as lay-out. It’s not unusual for a park or campground to have most of it’s sites occupied by “seasonal” residents. They’re the ones who have had an RV on a site for years and treat it like a summer cottage, often adding a huge wooden deck, a garden shed, trees, plants, flowers, a hedge, a fence, garden gnomes, sun dials and heaven knows what else. Add a couple of vehicles and their site is overflowing with stuff. For the hapless “transients” (a term for those staying for just one or two nights), trying the navigate the park’s often narrow interior roads while dodging the overflow from these sites can be a nightmare. To be fair, this criticism isn’t unique to Quebec. It also applies to many RV parks across Eastern Canada. No, language was not a problem in any of the RV parks we stayed at. In fact, most people working at campgrounds, gas stations, grocery stores, restaurants, tourist attractions and activities spoke at least some English. Many were as fluent as you or I. Someone once told me that about 80% of Quebec’s citizens have at least some English language proficiency and I believe that’s true. 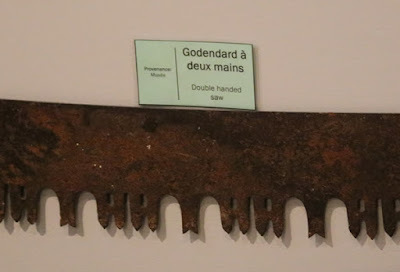 That still leaves the 20% as my wife and I discovered when visiting the, “Musée de la Forêt et du Saumon de Sainte-Florence” a small museum located in the village of Sainte Florence on the Gaspe Peninsula. Our museum guide spoke no English. Even though she tried very hard, by talking very slowly, choosing simple words and using lots of gestures, most of her explanations and descriptions went over our heads. 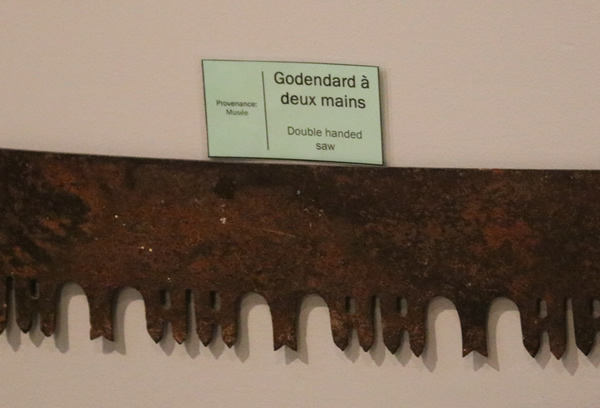 Thankfully, the exhibits had bi-lingual information plaques so we were still able to appreciate the collection. “No,” I admitted, wondering if my language skills were that bad, “I’m from British Columbia”. Then he shared with me a commonly held belief among many (most?) 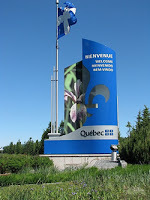 French folks that no one in BC or Western Canada spoke French or even cared to learn. He was so happy to discover that stereotype wasn’t entirely true that he gave me the coffee for free. Imagine that. How can people believe such silly myths and stereotypes?